Hey, I remembered how to knit these! 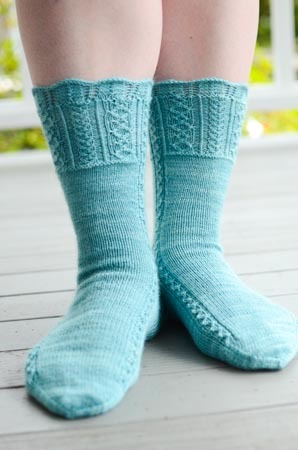 Pattern: Traveler’s Stockings from Nancy Bush’s Knitting on the Road . Unlike the first time I knit this pattern, I made the cuff a little longer. As written, it ends in a really weird spot, in the middle of a pattern repeat. I just worked the pattern repeat to its natural end. Yarn: Lorna’s Laces Shepherd Sock, Turquoise (22ns), 2 skeins. The color is closer to a very gentle sea foam green/blue than a rich turquoise, but it’s just right for my grandma, so who cares what it’s called. Needles: US 0 dpns, set of 5 (these ones ). I enjoyed knitting this pattern immensely, and Knitting on the Road remains one of my favorite sock pattern books of all time (and it was first published in 2001 – there have been hundreds of sock pattern books since then!). What’s next? I’ve been feeling an urge to crochet. I’ve been thinking about this blanket, which I never finished because I couldn’t find an edging that made me happy. And I’ve been thinking of taking it apart, and making a different blanket from it, perhaps one that’s made of smaller pieces/squares. But this will take some investigating… Unless you have a suggestion or two?!? Yeah, I haven’t knit any socks in years, either! I’m sure it’s nice to know you actually remember how! I love Knitting on the Road, too. I love these socks. I have one of the Interweave sock books, which might be my favorite though the Enchanted Sole (IIRC) is on my list for all of my fancy colorwork sock needs! No suggestions for the blanket, Kathy, but I just ordered a copy of Knitting on the Road. Several years ago, pictures of your knitted socks were what inspired me to learn. I’ve knitted via “recipes” for simple toe-up and cuff-down socks, but never followed a pattern before. This latest pair for your grandmother are so lovely that I think I’m ready to try! Thanks for the inspiration! Pretty socks! I love Knitting on the Road. These socks are absolutely lovely! I just got a book called Crochet Borders by Edie Eckman. It’s full of wonderful borders for blankets. She also explains how to get a border to fit the work, so that the border doesn’t make the blanket ripply or curl up. I highly recommend it! Those socks are beautiful! The color and the patter go perfectly together. Lovely!!! Knitting on the Road is one of my favorites too!